Electronic Arts has ended its nearly seven month long bid to takeover Grand Theft Auto publisher Take-Two Interactive, the company announced today. The two have remained quiet on the potential acquisition by EA, agreeing to keep ongoing discussions private in August after EA was rebuffed as a buyer multiple times. According to the press release issued by the interested buyer, following a "management presentation and review of other due diligence materials provided by Take-Two," EA says it has opted not to make a new proposal to acquire Take-Two and has ended talks. It was rumored to have done so last week. Take-Two issued comment on the news immediately following EA's announcement, writing “We remain focused on creating value for our stockholders and our consumers. This has been our goal since EA launched its conditional and unsolicited bid six months ago, a bid which was repeatedly rejected by our stockholders." Strauss Zelnick, Chairman of the Board of Take-Two is quoted as saying that the publisher is "actively engaged in discussions with other parties in the context of our formal process to consider strategic alternatives." Both parties' statements are after the jump. Electronic Arts Terminates Discussions with Take-Two REDWOOD CITY, Calif.—(BUSINESS WIRE)—Electronic Arts Inc. (“EA”) (NASDAQ:ERTS) today announced that while EA continues to have a high regard for Take-Two’s creative teams and products, after careful consideration, including a management presentation and review of other due diligence materials provided by Take-Two Interactive Software Inc. (“Take-Two”) (NASDAQ:TTWO), EA has decided not to make a proposal to acquire Take-Two and has terminated discussions with Take-Two. John Riccitiello, Chief Executive Officer of EA, said: “EA is tracking toward a record breaking year. We’re launching 15 new games including award-winners like SPORE, Dead Space and Mirror’s Edge, great new titles from the Sims, new family titles with Hasbro, and the highest quality slate of EA SPORTS titles on this generation of consoles. We’re also expanding beyond our core business with a series of direct-to-consumer launches including Warhammer Online.” About Electronic Arts Electronic Arts Inc. (EA), headquartered in Redwood City, California, is the world's leading interactive entertainment software company. Founded in 1982, the Company develops, publishes, and distributes interactive software worldwide for video game systems, personal computers, cellular handsets and the Internet. Electronic Arts markets its products under four brand names: EA SPORTS(TM), EA(TM), EA SPORTS Freestyle(TM) and POGO(TM). In fiscal 2008, EA posted GAAP net revenue of $3.67 billion and had 27 titles that sold more than one million copies. EA's homepage and online game site is www.ea.com. More information about EA's products and full text of press releases can be found on the Internet at http://info.ea.com. 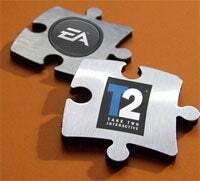 Take-Two Interactive Software, Inc. Comments on EA Announcement NEW YORK—(BUSINESS WIRE)—Take-Two Interactive Software, Inc. (NASDAQ:TTWO) today responded to Electronic Arts Inc.’s (NASDAQ:ERTS) announcement that it does not intend to pursue an acquisition of Take-Two at this time. Strauss Zelnick, Chairman of the Board of Take-Two, commented, “We remain focused on creating value for our stockholders and our consumers. This has been our goal since EA launched its conditional and unsolicited bid six months ago, a bid which was repeatedly rejected by our stockholders. As part of that commitment, we remain actively engaged in discussions with other parties in the context of our formal process to consider strategic alternatives. We’re especially proud of the success we’ve enjoyed over the past eighteen months and we remain confident in our ability to generate value for stockholders.” “Take-Two’s business has continued to strengthen since the time EA first made its offer. We have delivered terrific products to our consumers and we’ve been rewarded with very strong financial performance. We have an exciting future ahead of us, powered by our profitability, a significant cash position, the absence of debt, an undrawn credit facility and a terrific lineup of games. We are confident in the unique value of our business given our strong position in what is a growing and dynamic industry,” said Ben Feder, Chief Executive Officer of Take-Two. About Take-Two Interactive Software Headquartered in New York City, Take-Two Interactive Software, Inc. is a global developer, marketer, distributor and publisher of interactive entertainment software games for the PC, PLAYSTATION®3 and PlayStation®2 computer entertainment systems, PSP® (PlayStation®Portable) system, Xbox 360® and Xbox® video game and entertainment systems from Microsoft, Wii™, Nintendo GameCube™, Nintendo DS™ and Game Boy® Advance. The Company publishes and develops products through its wholly owned labels Rockstar Games, 2K Games, 2K Sports and 2K Play, and distributes software, hardware and accessories in North America through its Jack of All Games subsidiary. Take-Two's common stock is publicly traded on NASDAQ under the symbol TTWO. For more corporate and product information please visit our website at www.take2games.com. All trademarks and copyrights contained herein are the property of their respective holders. All trademarks and copyrights contained herein are the property of their respective holders.